This fifty six page book is another book in the exploring our world series. 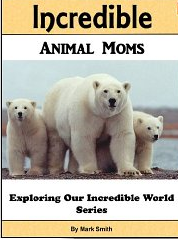 This volume focuses on the unique relationship between animal moms and their young. Smith has selected twenty animals; some are common but many are unique. He gives the reader just enough information to create a comprehensive portrait of the mother-child relationship and its uniqueness in the animal world. Each of them is accompanied by a photograph to illustrate the synopsis. The reader will be encouraged to pick out favorites and research other aspects of that animal’s life. Children aged eight and up might read the book independently. Younger children will enjoy an adult reading it aloud in several parts. Anyone who reads the book will learn something new; I know that I acquired a lot of new information. Did you know that a newborn elephant weights 250 pounds and that a mother elephant is pregnant for 22 months? All the female members of the herd live as one family and protect it. Some animal moms and babies are remarkably similar to humans. They even look and act like us. These animals are extremely smart; they make their own tools which they use to find food. Some have even mastered how to use sign language to communicate with humans. The orangutan mom spends six or seven years teaching her babies survival skills. She teaches them how to make a new bed of leaves each night. Unfortunately, orangutans are disappearing because humans have cut down the trees they need for their habitat. The cow mother also is similar to a human mother. She will have a bond with her calf for life and socializes with her young throughout her life. The mother will travel for miles to find a calf that strays from the herd. There are some animals that are very different from humans. You probably know that an octopus mom has eight arms, but did you know that each of them has a suction cup to move and catch food.? They are able to camouflage themselves and completely disappear. They also have a bird’s beak which they use to eat their food. An octopus mom has only one chance to have babies. She will lay as many as 200,000 eggs! For one month until they hatch, she stands guard for predators and does not eat. Some of these moms get so hungry that they eat their own arm rather than allow the eggs to go unguarded! Seahorse moms do not do any of the work in having babies. She chooses one mate, and lays all of her eggs in the dad’s pouch. He carries them until they hatch. He has a special hormone in his body to protect the eggs and give the eggs everything they require. Some animals are beautiful and dangerous at the same time. The Strawberry Poison Frogs are brightly colored. They can be red, blue, green or spotted. They get their poison from the things they eat. These frogs are only about one inch long, but their bright color is a warning not to eat them. The mother lays about five eggs. When they hatch into tadpoles, she carries one at a time up a tree that may be 100 feet high and places it into a small pool she has made in its leaves. She feeds each one of her own eggs until they are fully grown. Pretty incredible for such a small creature! I have only talked about a few of these incredible moms. Read this well written and illustrated non fiction book to find out much more extraordinary information about our animal world. I would like to wish my subscribers and their families all over the world peace, joy, health, and happiness however and wherever you celebrate during this holiday season. A starving child dressed in rags hears a voice in the darkness that urges him to follow his lantern so that he may discover a home with a hearth and a warm fire. This spirit instructs the boy to hold up his lantern and peer through the windows he passes along the way. The boy obeys and observes a young boy reading in a room with presents piled under the tree. At the next house he views this same boy who is now a father with a child on his knee; the kitchen tables piled high with food. As his lantern grows dimmer, the boy gazes through another window viewing that boy as an old man. No one in these houses is able to see his plight. The lamp is beginning to fade, and so is the life left in that little boy. When New Year dawns, those lucky children are still reveling in the holiday oblivious to his plight, while that little needy little boy has become a ghost. This is a powerful and well written short story done in verse that will remain in memory long after you read it. The illustrations are colorful, fluid, warm and penetrating; they reinforce the words and draw on compelling images that do not allow the words to recede from memory. 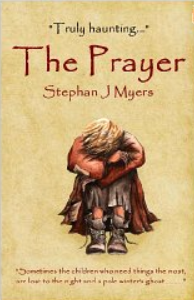 Myers represents the story through the eyes of the starving child though the execution does not always work. I would strongly recommend this book as a family read or a book for classroom discussion reminding all of the deeper meaning of the Christmas season. The story line of this book is a simple one. At the outset the reader is given a challenge. A gang of pirates has invaded and sacked your village depleting it of all valuables. You alone have the courage and determination to sail across the seas, track them down and relieve them of those treasures! At last your rowboat arrives and you have the pirate ship in sight. Let the adventure begin! This book is an interactive, choose your path e book. On each of the approximately fifty pages, the reader is given two choices. Unfortunately, the child is often redirected back to a page that has already been read. Eventually, the explorer is lead to the pirate treasure regardless of the choices he makes along the way. The authors suggest that the book is appropriate for ages three to eight. The vivid, bold and animated illustrations by Livi are stunning, but the text is somewhat rambling and difficult for a young child to follow. Here is one example, “As the ship rocks slowly and the waves gently lap against its hull, your mind tells you not to trust your instincts, because the calmness could be deceiving.” In addition, the complexity of vocabulary would inhibit a younger child from independent reading. Words like plundered, anxiety, dangling and abandoned are not easily explained by the illustrations alone. I read this book on a Kindle Fire HD. The pictures were brilliant and the interactive tabs worked fine. Some reviewers complained of having difficulty reading the text because it was printed in white and the print too small. Reviews on the book on amazon run the gamut from five to one stars, I would place it right in the middle. I feel there is a place for interactive readers with rich illustration and simple plot lines, especially for reluctant readers. 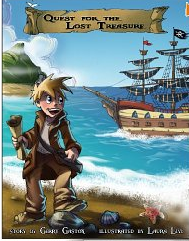 Certainly, a pirate adventure story that allows the child to choose his own solution is something such a reader would enjoy. But don’t expect a child younger than eight to succeed in reading this book on his own. The long sentences and more difficult word meanings will necessitate that a parent or teacher will need to provide assistance. If you enjoyed reading this post, please subscribe by clicking on the word Follow or by hitting the orange RSS feed button in the upper right hand corner. This short fantasy story that is appropriate for tweens, teens and adults involves a boy named Mason who lives with his best friend, Bess, and his mother, Queen Anna, in a land called Sanctea. They once lived in a small town on the planet earth; but Anna, who has the ability to pass from one dimension to another, decided to leave the earth. The Queen awakens from a dream in which she sees their former neighbor’s daughter named Katie sucked into a vortex. Hoping that the child has been transported to her own homeland, the Queen sends her special messengers, the Elgae, to search for her. Unfortunately, she is not found. Anna suspects Katie is the victim of foul play. Anna cannot leave her world without weakening her powers so she sends her son and Bess to find Katie and return her safely to earth. Mason will take the magic wand his father left them. Bess is given a special black medallion that will transport them between worlds. Anna casts a spell to transport the children back to their old home on earth, but Bess finds, to her chagrin, that she is no longer a young girl but a black and white cocker spaniel! The two children locate the pool where Katie went swimming, and when they sneak in at night find themselves sucked into that very same vortex. They arrive in a magical land called Nomreg where there are feathered green trees, lollipop flowers, floating TV screens in the sky, and beautiful rainbows. Appearances are deceiving; the children find themselves in a war between the Fairies and the Bugzies. 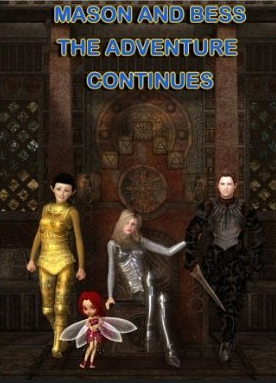 They will each face many dangers and adventures in their quest to find Katie. Will the power of the magic wand be enough to ward off their enemies? Are they successful in locating and returning Katie to earth and ultimately traveling back to their own world of Sanctea? There are lots of twists and turns in the plot and some surprises along the way. Even though the story is short, the main characters are believable and well developed. I am looking forward to meeting them again in further adventures. 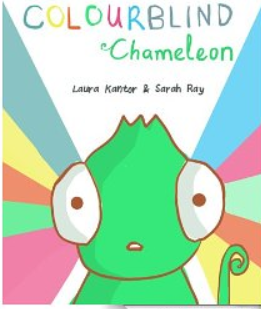 This book exposes the plight of a colourblind chameleon who lives in the Amazon forest. As he journeys through forests, valleys, and waterways, this poor creature is unable to camouflage himself in the environment like his fellow chameleons. While his friends simply change to green when hiding in the forest or blue when it rains, he explodes into colors like purple or even worse, might accidentally transform into polka dots and stripes. Not only is he different, but he cannot control himself because he is unable to realize what color is being projected. What a dilemma for a creature whose strength is to be able to blend in; all this chameleon is able to do is stand out! Will this little chameleon be condemned to be an outcast? Not a chance. One day he comes across a suitcase whose contents have been strewn all over the landscape. He does indeed find clothes and accessories that he can use to transform himself. When some of his chameleon friends drop by to visit, they get an unexpected surprise as well. The illustrations in this short book are very colourful just like our friend, the colourblind chameleon. They are drawn in a non-traditional format as the book does not follow the same pattern page by page. In fact, many of the pages look very similar to a comic book or children’s graphic novel. This should not pose a problem for children who are independent readers, but might be difficult for a younger child to follow. Still the text is not difficult and most children age six and up will be able to master it. Children will grasp the lesson that being different or having a disability might appear to be a difficult challenge, but that persistence and good will toward others will enable one to succeed. Take a peek at our colourblind chameleon friend’s short story. You and your child will not be disappointed. If you enjoyed this post, please subscribe by clicking on the word Follow or by hitting the orange RSS feed button in the upper right hand corner of this page. Heather and her mom walked into the kitchen. They decided that they needed to act quickly so they talked with grandma and hatched their plot. Early the next morning all three jumped into the car and headed to the local Home Depot. In less than thirty minutes they had found the perfect tree, an eight foot tall Douglas fir, replete with thick, sweet-smelling branches. They hauled the tree atop the SUV and brought it home. Alex and dad had already installed their tree in the living room. That did not deter the ladies from installing their freshly-cut tree in the dining room alcove. By the end of the day both trees stood proudly, one smelled of pine but the other did not! When people came to visit that year, they were treated to two beautiful family trees. Most of them were at a loss for words; they refused to take sides in the debate over which was prettier, but the next year the new artificial tree quietly disappeared!